When most non Japanese people first see oden, they usually start by swearing to themselves that it will never, ever enter their stomachs. Newcomers to Japan are most likely to see it in their local convenient stores sitting in big metal tanks (next to the nikuman). The smell that goes along with it is usually gagging, and you'll be forgiven if you think it looks more like a bad science experiment gone really wrong. It's unfortunate that people have to see it in such a setting. Convenience store oden is of course, swill, but if you're daring enough to try it in a real restaurant, or better yet an oden restaurant, you might just become an oden lover like me. So what is oden? Taking a look in the pot below, it appears to be a bunch of mainly unrecognizable things boiled in murky water. You are correct in this assumption. Cooking has never been easier. Cut the packages open, dump them in a pot and heat them on a low heat for a few mintues. When ready, pour some of the mess into a bowl, add some spicy mustard, grab some chopsticks and you're all set. Can't get much more normal than a boiled egg right? 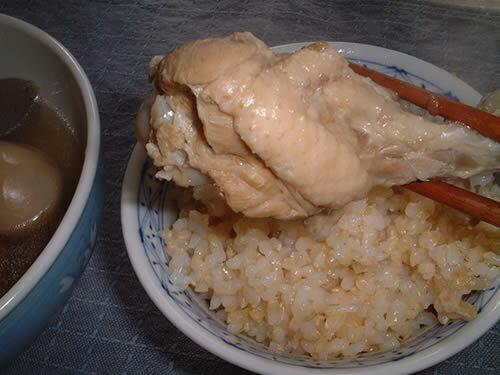 The brownish colour comes from being boiled in brown coloured soup. Probably the most common oden ingredient. 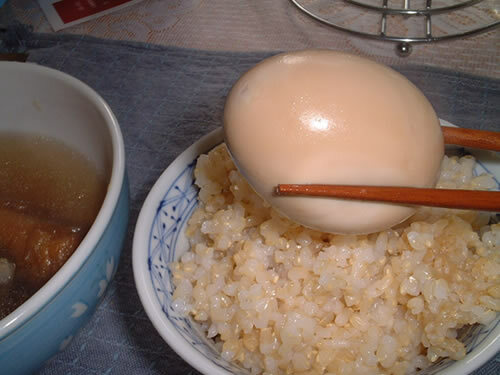 You'll always find an egg or two in your oden. Yum! 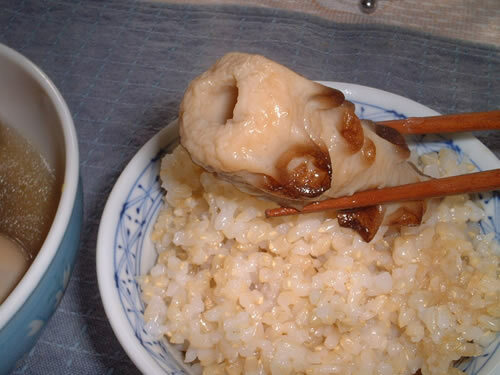 First time for me to see a chicken leg in oden, and after seeing this one, I hope I never do again. It looked like it had already been boiled for a few million years before it made it to my apartment. Grisly tendons and grey bone stuck out everywhere making me think this was some zombie chicken or something. However like most things you find in oden, it ended up tasting ok. Just close your eyes. Still in the realm of normality, although this may look a bit scary, it's actually just a chicken meatball called a 'tsukune' in Japanese. Pretty tasty! Looking quite threatening at first glance, you're actually in for a treat. 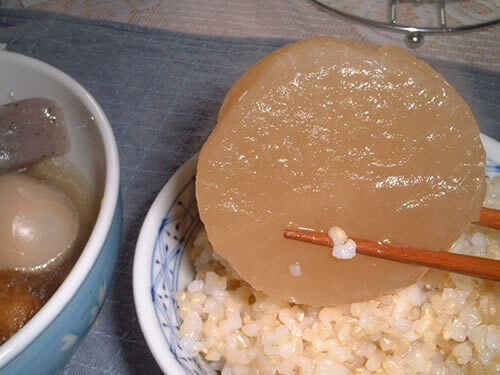 Although it may appear to be a slab of monkey brain or maybe jellyfish, it's actually only a slice of 'daikon' which is just a big radish. Next to eggs, this is another staple. 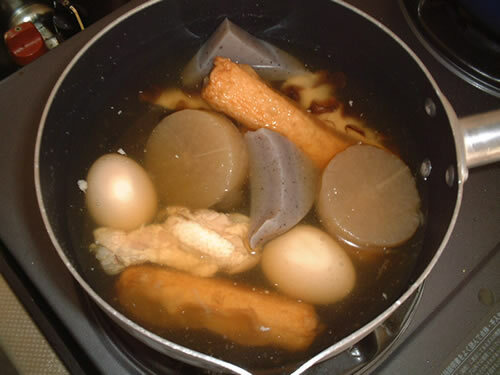 You'll always find daikon in your oden. Very nice! Back home, any plant that comes out of the water is automatically 'seaweed' but here in Japan, they have names for each different one! Not only that, they eat some of them! Living far from the ocean in Canada, seaweed never entered my diet, but some of it is actually pretty tasty. Here we have some 'konbu' tied in a pretty little knot. 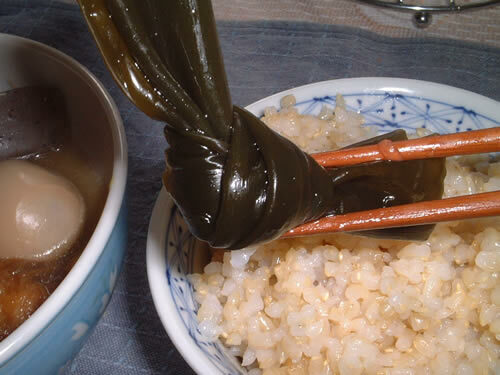 You might know it as that thick rubbery seaweed called 'kelp' (the only seaweed name that I know in English) that always washes up on the beach and stinks. Yeah it's food here. Ok now we're getting into the realm of the bizarre. 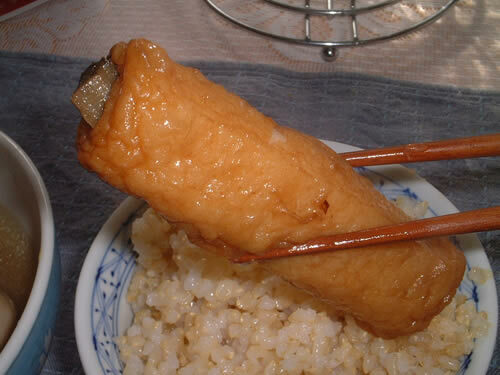 Cheerfully known as a 'fishcake' in English, this unrecognizable log is pressed and processed fish paste wrapped around a piece of burdock (an unknown vegetable in the Western world). I'll admit this one takes some warming up to, but tasty all the same. Burdock, known as 'gobo' in Japanese, is one of those things that tastes much better than it looks. Is it a piece of octopus that's had the crap boiled out of it? A dead and peeled piece of bloated snake? Nope, it's fishcake again. This one is called a 'chikuwa' in Japanese and no one today can figure out why it was ever invented. I suppose the shape is supposed to resemble an octopus leg? Not sure. Anyway despite it's horrid appearance, it's also pretty good. Be brave! Last on the list of the eight items in my oden bag is perhaps one of the strangest members of the team. Called 'konnyaku', this grey, speckled lump is always cut into a triangle shape but don't ask me why. 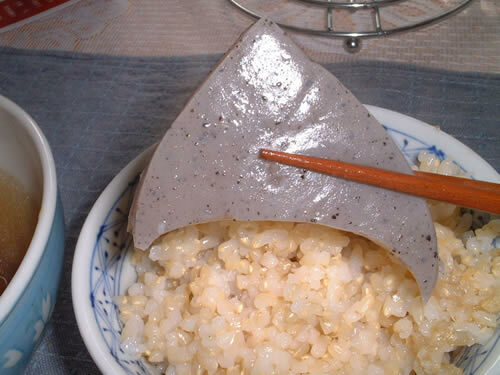 It may look like a shark fin but it's just a lump of gelatin, completely tasteless gelatin at that. 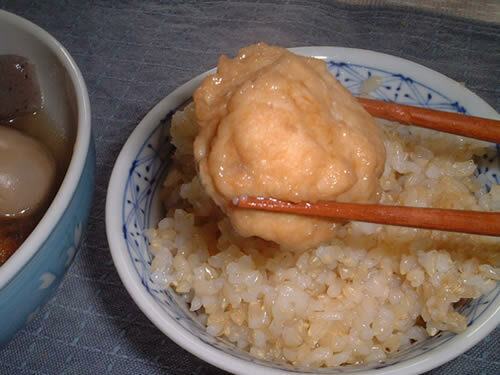 This is another oden staple which you'll almost always find, but definitely one of the least exciting of the bunch. You can have my konnyaku if you want. Although there were only 8 different items in the bag, this is by no means a complete list. When it comes to oden, Pretty much anything that can be boiled until it's just on the point of becoming mush is fair game. So what's the verdict on oden-in-a-bag from the supermarket? 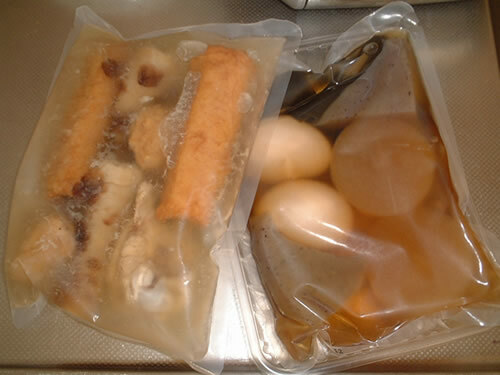 Well although I do like oden, supermarket bag oden is only one step up from the stuff at the convenient store. If you have a chance to go to a real oden restaurant, take it! You'll thank me later. Don't forget the karashi (spicy mustard), when your sinuses are on fire you'll know you've used the right amount. It's all part of the fun!